Aren't you cute, over there making fun of Diablo III's Error 37. So old-fashioned! Haven't you been following the latest trends? Everyone knows that Error 37 is yesterday's news. Today, the hot new error is Error 3003! Oooh, just look at it there, strutting onto your computer screen. So fierce, so present. I bet you thought you'd be able to play your game today! I bet you thought that stupid, constant Error 37 you got yesterday had been resolved, and that maybe the idea of an always-on internet requirement for a single-player game wasn't acutally flawed in a fundamental way. Shows what you know! Time to get with the hippest fashions, my friend. Go ahead. 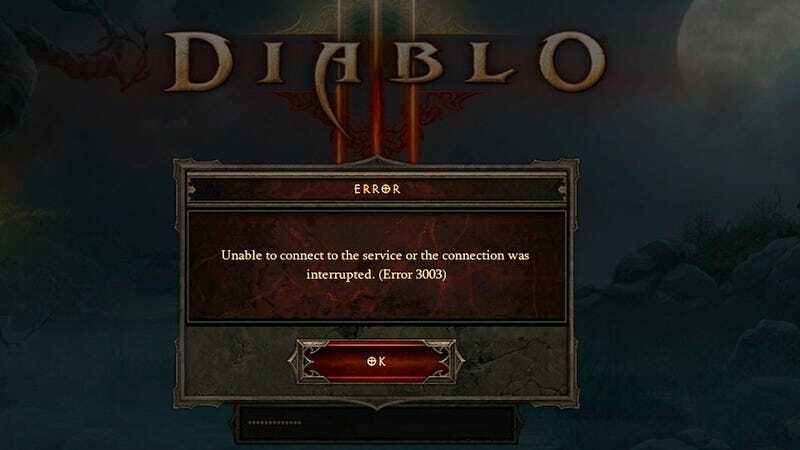 Boot up Diablo III and try to play it. You'll most likely get an up-close look at our fashionable new friend Error 3003. If you're lucky, you may even see his cousin, Little Miss Error 75. She's shy, but mark my words: She may just be the Next Big Thing. Update: Blizzard has apologized and announced that they hope to get things back up and running by 11:45 PST, or 2:45 AM EST. We're continuing to work on the issues currently affecting the Americas region, which are resulting in failed login attempts and service issues. While we've identified the causes and are working to resolve them, we expect our efforts to require an approximate two hours to complete. We expect game services to fully return by approximately 11:45 p.m. PDT. We apologize for the downtime, and appreciate your continued patience.